Description: These Unique Diamonds feature unusual techniques to decorate the inside portion. 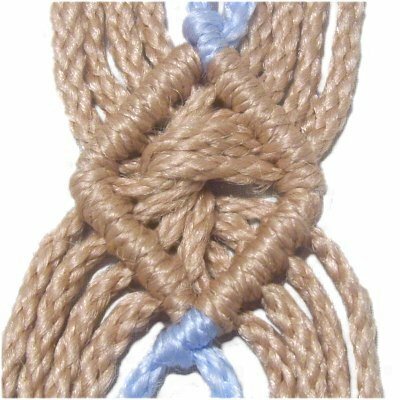 Unlike other diamonds, there are no actual knots in the center. 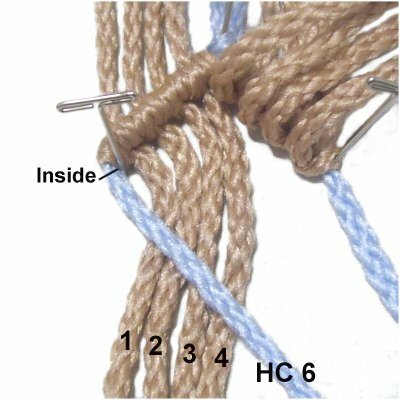 Instead, you either fold, weave, or twist the working cords to decorate the inside. 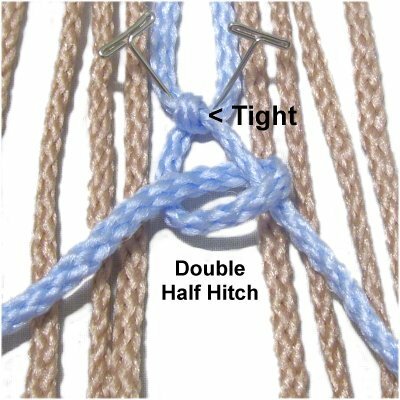 Make sure you know how to tie Double Half Hitches in a diagonal row. Click on the image or link to go to the page. Another page you should visit is Vintage Diamonds. The interior of the diamonds feature other decorative knots. When you make the Unique Diamonds on this page, you start by creating the top portion, as described in the following steps. A different color was used for the two holding cords (light blue), to make the images easier to understand. Step 1: Secure the holding cords vertically to your board. On each side, secure 4 working cords. Cross holding cord 5 over cord 6, heading right. Stretch it so it has tension, then secure it. 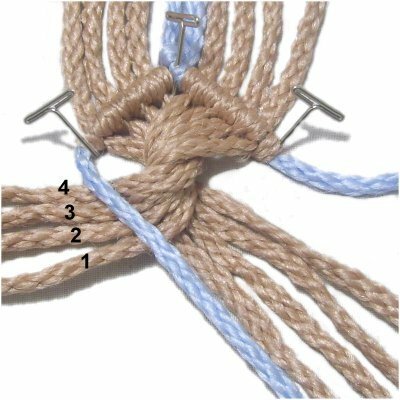 Step 2: Attach cord 6 to holding cord 5 with a Double Half Hitch (DHH), rotating counter-clockwise. Both Half Hitches should be TIGHT. 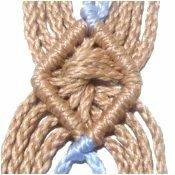 Your Diamonds will look much more appealing if the rows of knots are firm. 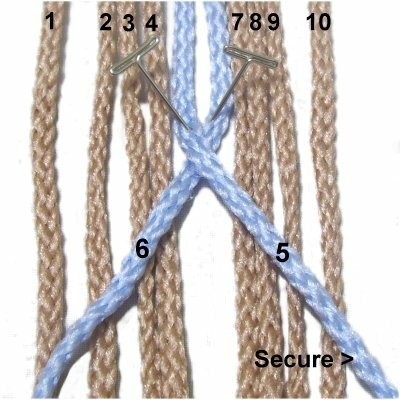 Step 3: Secure BOTH holding cords at the top and bottom, with lots of tension, so the rows you will be making are straight. 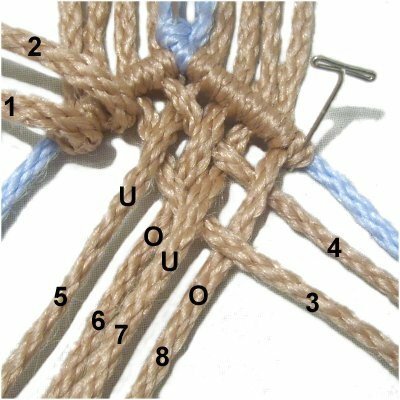 The angle of the holding cords determines the shape of the Unique Diamonds, so adjust each one until you are satisfied. Make sure both sides have the same slant. 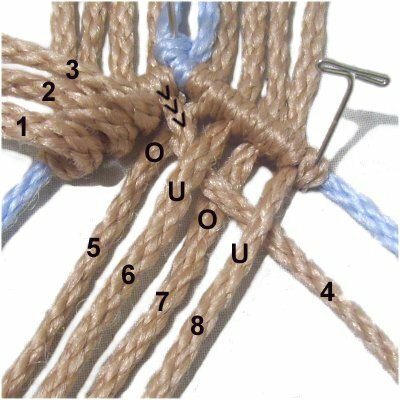 Make sure the knots are neatly arranged without overlapping (see next image). Step 5: Secure the top portion of the diamond at the top and on the corners. Only the working cords are used for the center area. You will now learn three techniques for filling the center area (inside) of these Unique Diamonds. The bottom portion is included in the instructions for each technique. You have to pay close attention to the details with these designs, so take your time creating them. Proper tightening and careful positioning of the holding cords is very important. The first design is called the Window Technique. The cords are folded away from the center, which leaves a large space. It's easy to make and quite unique. The most challenging part is keeping the corner angles sharp. That's easier to do if you use 1mm to 3mm flexible material, such as the cotton shown in the next image. Olefin in 4mm size was used in these examples, so the corners were rounded. 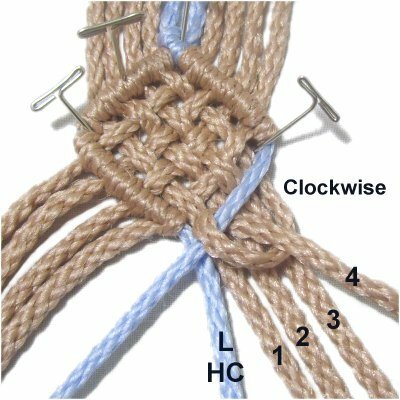 The Window Belt is a Macrame project featuring this technique, if you want to give it a try. Step 1: Create the Top Portion as described in the first set of instructions. Move holding cord 6 towards the center (right), resting on top of cords 1 - 4. Secure it with tension. Designer's Tip: To help form a sharper corner, you can place a pin to the inside of the holding cord next to the last DHH in the upper row (see image above). 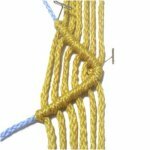 When you tighten the knot in the following step, it should rest against the pin. There should be a tiny gap between the top and bottom row. Step 2: Move working cord 4 across cords 1 - 3. Attach it to holding cord 6 with a counter-clockwise DHH. Step 3: Attach working cords 3 - 1 with DHH (in that order). Step 4: Move holding cord 5 towards the center (left), and secure it with tension. 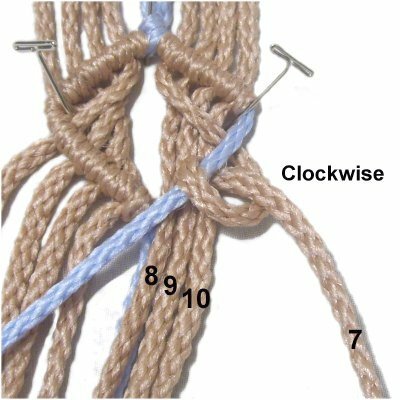 Attach cords 7 - 10 to it with a clockwise DHH. 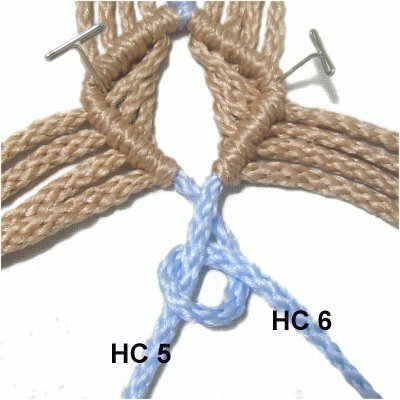 Step 5: Close the diamond by attaching holding cord 6 to holding cord 5 with a clockwise DHH. Description: Unique Diamonds can be made with weaving. 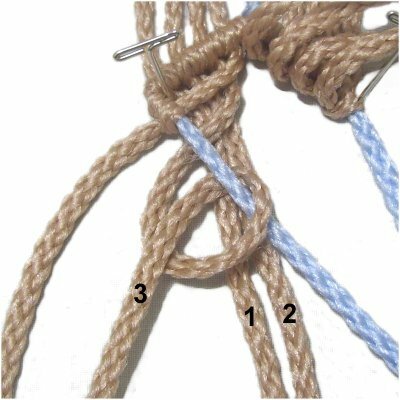 For a small size you would weave each cord, as described below. For a large diamond, you could weave groups of two or more cords. 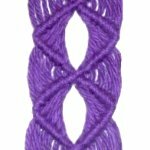 The key to making this design appealing is to make sure the working cords are tight and straight as you create the bottom portion. Step 1: Make the Top Portion of the diamond. Keep the holding cords secured after you are finished. Fold cords 1 - 4 out of the way. Arrange cords 5 - 8 diagonally, heading left. Step 2: Weave cord 4 over - under - over - under cords 5 - 8 (left to right). Step 3: Weave cord 3 under - over - under - over cords 5 - 8. Step 4: Weave cord 2 over - under - over - under cords 5 - 8. 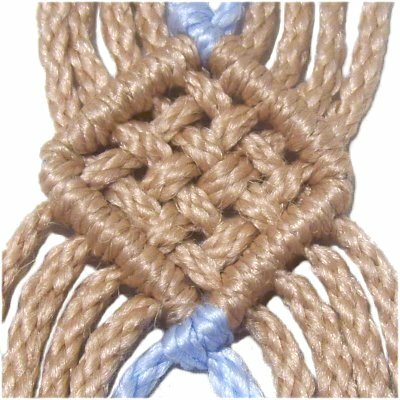 Weave cord 3 under - over - under - over. Step 5: Pull each working cord firmly to tighten the weaving, then secure them to your board. 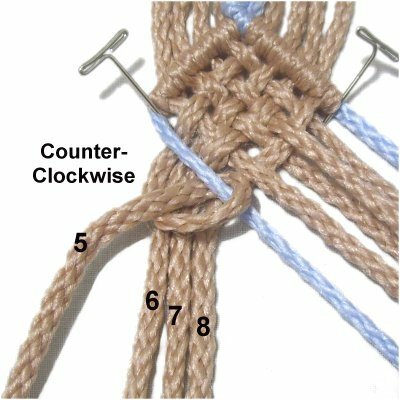 Move the left holding cord towards the center, following the angle of the weaving. Step 6: Attach cords 5 - 8 to the left holding cord with counter-clockwise DHH. 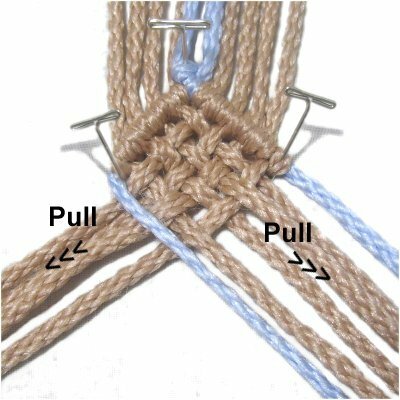 Pull each cord before tightening the first Half Hitch, so it's straight and has tension. 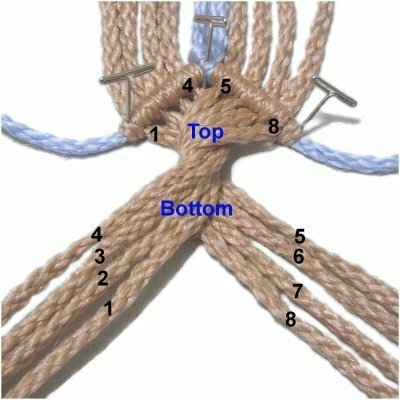 Then tie the second knot. Designer's Tip: Make sure the top portion of the diamond remains straight as you pull the working cords. You can place a pin in the middle of the row. 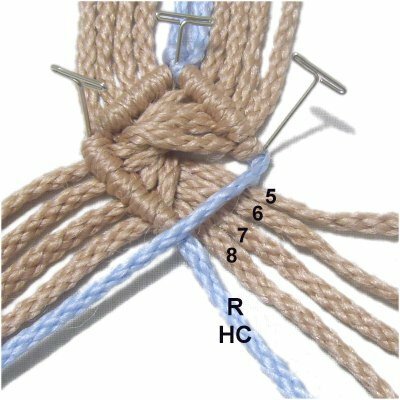 Remember that these Unique Diamonds will look better if the knots are tight and do not overlap. Step 7: Move the right holding cord towards the center. 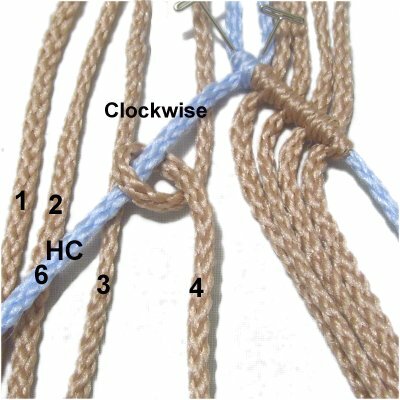 Attach cords 4 - 1 to it with clockwise DHH (in that order). 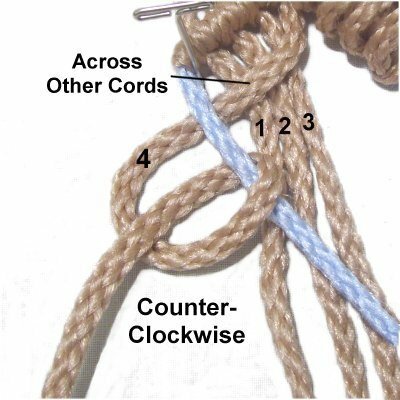 Pull each cord before tightening the first Half Hitch. 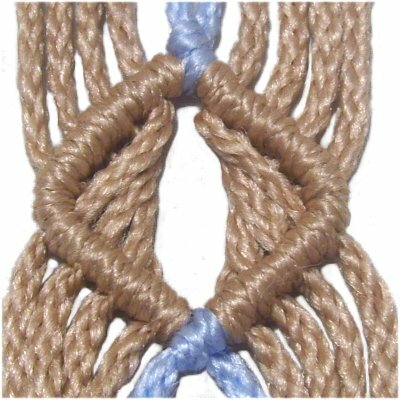 Attach the left holding cord to close the diamond. Description: This is one of the most unique Diamonds I've seen. It was found in a Macrame book written in 1899. The working cords are twisted and flipped upside down. There are other ways to rotate the cords, but the method shown below works the best. Step 1: Create the Top Portion of the diamond. Place pins on the last DHH on each side. 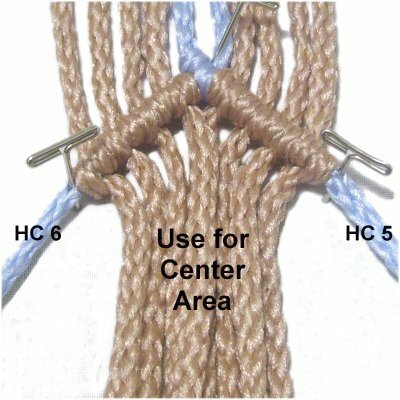 Curve cords 5 - 8 around 1 - 4, then bring them towards the right. 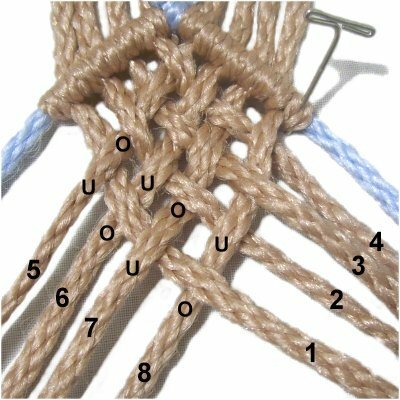 Turn them upside down so that the bottom of the cords is face up, and cord 5 is at the back of the group. On the left, turn the cords upside down, too. Cord 4 should be at the back of the group. Step 2: Bring the left holding cord towards the center. Attach cords 4 - 1 to it with counter-clockwise DHH, in that order. 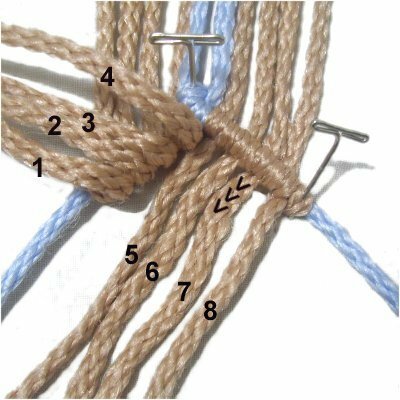 Pull each cord to remove the slack before tying the knots. Step 3: Move the left holding cord towards the center. 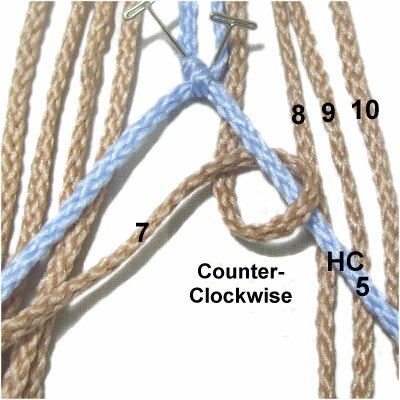 Attach cords 5 - 8 with clockwise DHH. Pull firmly on cord 8 before you attach it. Attach the right holding cord to close the diamond. Have any comments about these Unique Diamonds? Contact Me.